"While straightforward, the color and fabric you choose can be affected by more than the decor of the room in which the lift chair is going to be placed. For example, continence issues, pets, children, or grandchildren can all play a role." 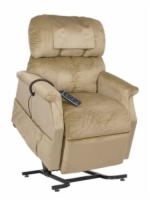 Pride and Golden lift chairs offer different fabric selections on different chairs depending on the model you select. Remember that a non-standard fabric selection may increase the cost of your lift chair. We feature digital versions of fabric swatches on each individual lift chair's page, but please note that your color settings on your computer's monitor may distort the fabric's true color and texture. 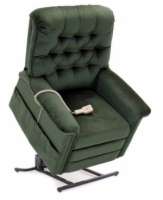 To obtain physical fabric swatches, please contact our lift chair experts at 1 (800) 736-0214.